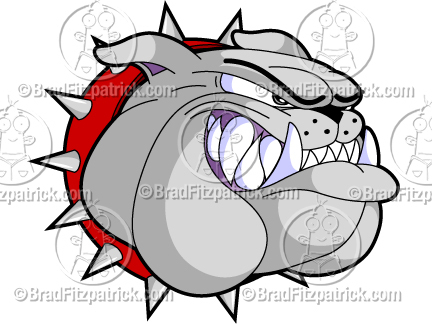 Bulldog Head Growling Cartoon Mascot Logo Clipart: Here’s a hound you don’t want to mess with! This brutal clipart bulldog can’t wait to sink his teeth into your opponents and enemies, and when he does you can be sure he won’t let go! He makes a perfect mascot for the team that’s tough, tenacious and resolute, and he can’t wait to get to work terrifying the other guys! This cartoon graphic is well-suited for tough guys (and girls), bodybuilders and military units with a reputation for relentless resolve, so don’t delay and download this savage stock illustration today! Image details: This is a stock image of a bulldog in profile (head only) facing right. His fur is light gray with some shading, and he has a bright red collar with large spikes around his neck. He is snarling, displaying lots of razor sharp white teeth and his pink gums. He has the classic bulldog jowls, and his eyes are set in a fierce and determined expression.